Jenna, you graduated from York House in 2011 and then went on to Claremont McKenna College. What did you study and why? My passion for the social sciences and humanities was definitely cultivated at York House in classes with Mr. Cropley, Mr. P, Mr. Abt, and Ms. McIvor. It was not until university that I realized I was also interested in business and decided on an interdisciplinary major in Philosophy, Politics, and Economics. After a trip to Tanzania in 2012 with my parents to explore their birthplace, I began to focus on development economics with an emphasis on East Africa. You were until recently based in LA. You’ve now moved to Kenya. Please tell us how that came about. Upon completion of my undergraduate degree, I was recruited to join an economic consulting firm in LA and worked as an Analyst for two and a half years before moving to Nairobi. I was fortunate to have the opportunity to build a non-profit consulting practice at the firm. In addition to working on private sector client engagements, I also worked on a number of projects for non-profit clients in Haiti, Rwanda, Kenya, and Tanzania through this practice. I was extremely excited about these projects and was passionate about their outcomes, and I decided to search for a position at an impactful social enterprise in East Africa as my next professional step. Please tell us about your company and position in Nairobi and why you decided to work there. Ever since my first trip to East Africa in 2012, I have not stopped thinking about the region, particularly about ways to combat economic inequality and provide basic needs to the ultra poor. During my search for a position in the region, I was introduced to one of Sanergy’s founders through a mutual connection. I was extremely impressed by their innovative and impactful business model. Nairobi’s informal settlements (slums) are not connected to the city’s sewer system and human waste is disposed in the streets and rivers, resulting in serious consequences for the community’s health. 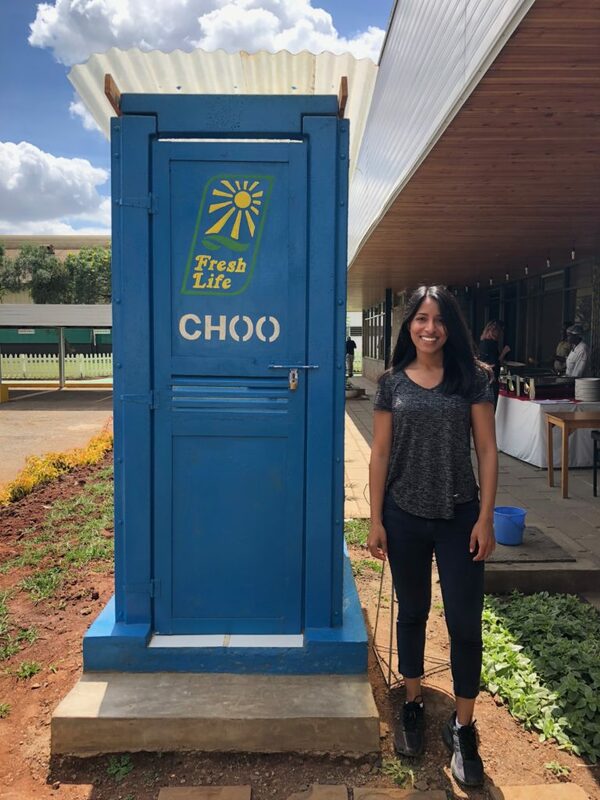 Sanergy has developed a sanitary toilet (see picture) and franchises it to the residents of the informal settlements who operate the toilet as a small business by charging customers a small fee to use it. Sanergy safely collects the waste, transforms it into fertilizer, and sells it to local agriculture companies. My role is to maximize operational efficiency for the division of Sanergy that produces and franchises the sanitary toilets. My work cuts across all areas of the business including finance, sales, customer support, and supply chain. You exemplify the school motto “Not for Ourselves Alone” – Did this passion for community service flourish at YHS? Yes, definitely. My desire to improve the global community is something that was nurtured throughout my 13 years at York House. I value the emphasis the school places on community service – whether that is through raising funds for the annual Terry Fox Run, committing to sponsor a child’s education abroad, or through disaster relief efforts. A particularly memorable community service engagement was my trip to Paraguay in 2010 with a group of classmates to volunteer with Habitat for Humanity. What is life like in Nairobi for a young woman? Nairobi is an incredibly vibrant, world-class city with an amazing culture and a fantastic food scene. People here are very welcoming and it has been very easy to build a community of friends. Nairobi’s nickname is the “Silicon Savannah” due to the city’s thriving technology sector and since many private sector and social impact start-ups operate here. It is a fun city to live in and I am really enjoying my time here. Do you have any life advice for the newly graduated Class of 2018? Some of the brightest people I have ever met were my classmates at YHS. As Yorkies, we are so lucky to grow up in an environment full of talented and driven young women. I would advise new graduates to continue to stay in touch, continue to build their friendships, and “pay it forward” – offer advice and help to each other and continue to build a community of mutual support. Also, I would advise new graduates to explore the world and share your skills with the global community. You will gain personal satisfaction from working to make a positive impact on others’ lives, and you will gain confidence in yourself when you move to a new city and build a new network.